I am totally sneaky when I cook Spaghetti Squash Marinara. I serve it to my kids calling it “spaghetti and meatballs”, (which they LOVE) and they eat it right up! 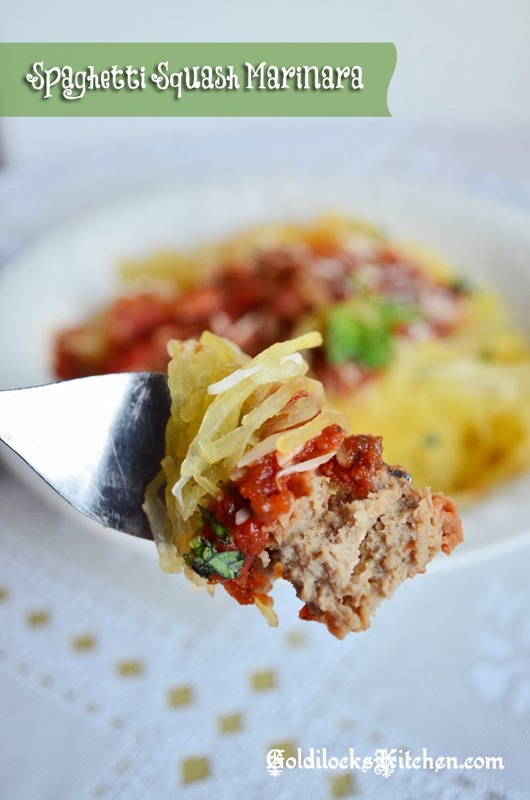 No matter if you’re looking to sneak your kids some healthy food, or if you’re looking to cut carbs and calories, spaghetti squash is a great alternative to pasta. Add a salad and you have a great ‘Italian’ meal that’s guilt free! 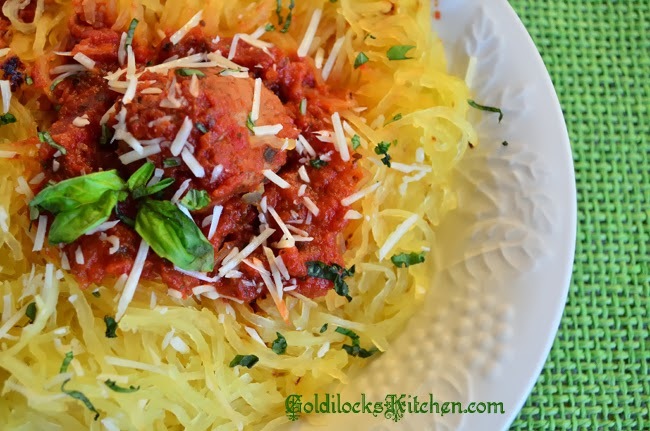 Spaghetti Squash is pretty cool to work with! Once you bake it, just rake across the flesh inside with a fork and you have spaghetti! 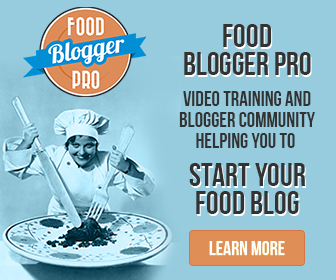 You’ll love the simplicity of this meal~ there’s not a lot of preparation, it’s good for you, and tastes great too. A sneaky way to add more vegetables into your diet and have a great satisfying low calorie meal. Place oven rack in the middle position and heat the oven to 375 degrees. Spray a baking sheet with olive oil cooking spray. Place the two halves of the squash facing down and poke the outside a few times with a fork. Bake for about 45 minutes, until the squash is tender. While the squash is cooling, warm up the turkey meatballs in a large frying pan. Once they are thawed, pour in the marinara sauce and heat to a simmer. Turn the heat to low. With a fork, rake the flesh of the squash into a large bowl. It will look like spaghetti-like threads. There should be about 3 cups. Discard the skin. Dish up the squash into individual servings and pour the marinara sauce and one or two meatballs onto each serving. sprinkle with Parmesan and basil and serve.